Immediately after our Chiefland trip in February 2002, the guys started talking about a desert southwest trip. We began to investigate sites and chose New Mexico Skies (NMS) as our destination. 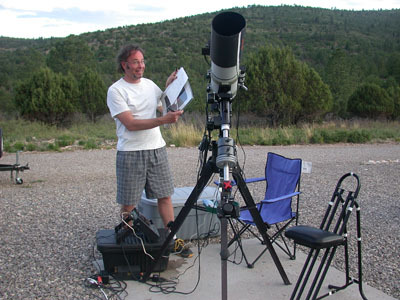 New Mexico Skies is the leader in remote and destination astroimaging for the amateur. Please see their website for the impressive list of imaging equipment on hand for users to rent on a nightly basis. In addition to the fine astronomical equipment, NMS has a complete library with internet access via desktops or wireless connection via your personal laptop. The library is also host to the midnight cappuccino treats-mmmmm. The group started with Kirk Rogers, George Whitney, Warren Keller, and me, but that would soon change. I believe we had at least 9 guys in the clubhouse at NMS each night of the 2 weeks of our stay. It was a great group and "momma Whitney" made sure all of the fraternity boys were well fed and well behaved. Thanks "momma Whitney." Can you believe this? After changing travel plans many times, the final plan called for George and Warren to drive out a truck towing our equipment in a trailer. Wow, this permitted the rest of the group to fly to El Paso. We are eternally indebted to George and Warren for the trek cross-country. In some ways, I feel like I missed a unique opportunity in that truck. Many images on this page are courtesy of Ernie Mastroanni, Kirk Rogers, or Joe Schaefer. Thanks guys. We had a little turnover of imagers/observers from week one to week two. States that were represented were West Virginia, Maine, New Jersey, New York, Wisconsin, Missouri, and Massachusetts. Week one group from left to right. Back row standing: Jeff Ball, George Whitney, Kirk Rogers, George Walker, and Saul. Matt BenDaniel explored the imaging potential of the tremendous on-site equipment at NMS. Matt is in the FCT150 dome with Mike Rice, owner of NMS. Matt captured some wonderful star trail shots at night and hummingbird shots in the daytime. Check them out here. The imaging area at NMS is loose gravel with 2 concrete pads. Mike Rice shared with us that our group was the largest single group of imagers in the history of NMS. Two or three more concrete pads would be a nice addition to the area. We made do with patio blocks nestled down into the gravel and that proved to be stable for imaging. There are two power poles at the back of the area which provided plenty of power for our setups. Horizons are adequate for imaging at any elevation one would desire. You may be mindful of a tree on the backside that could possibly interfere with sighting polaris through a polarscope during your initial polar alignment for the evening. George Whitney with a wonderful setup for photography with an AP 155EDF, AP Traveler, and two Bronica cameras all on an Astro-Physics 1200 mount. George shoots with medium format Pentax through the scopes and an ST10XME. Kirk Rogers shows off his AP1200 with AP 130EDT, Takahashi FSQ 106, and Pentax medium format camera bodies with lenses for wide field imaging. Warren Keller does wonderful work with his GM8, Intes MK69 f6, and Nikon camera lenses. You can see some of Warren's work featured at the Intes MK69 site here. Joe Schaefer images with a Takahashi FS128, a Nikon camera and lenses with an Orion guidescope on an Astro-Physics 900 GOTO mount. "Little Robbie Burgess." Yep, not too many people have a theme song, but you could hear Robbie's song echoing in the Sacramento mountains at night. Unfortunately, the weather never really allowed Rob to use the big dobsonian seen here. Rob was great company for a bunch of stressed out astroimagers. Dave Shimek ready to observe with his dobsonian. Dave drove in with Kurt Amuedo from St. Louis, MO. Check out Dave's images from the trip here. My original plan was to shoot with this setup with the Traveler and Pentax 300mm lens on a side-by-side plate. I felt this was just a little too much for the 600 mount and switched to just the Traveler alone. Now I have a 900 mount and can image with the side-by-side configuration with no trouble. Skies looked promising this day, but as you know, clear skies in the day only get worse as night falls. Once again, the Astroglide team had a great time. It is wonderful fellowship doing what we love best. Rumblings of next year's trip have begun. Chile? Sunglow Ranch? Spruceknob, WV? Stay tuned. The weather numbers were 5 out of 16 nights were photographic in that one could image all night with one night extremely dewy. The first few days were mired in a stagnant pattern of cloud formation coming from the southeast. The pattern brought to us a delightful spring hail storm, the likes of which I have never seen. A few of us were in the truck on the way to Alamogordo for shopping when it hit. A conversation was hard to hold inside the car with the pelting hail cracking on the metal. We were literally riding on a coat of hail 1" thick on the road. Ernie and I began to consider driving westward into Arizona. The weather pattern was stagant over New Mexico. So on day 3, Ernie and I pulled out for Sunglow Ranch, AZ. The images below capture the resulting ice cover after the hail storm. A truly unique experience. Not to be outdone, Kirk and George were nearly fried by a lightening strike. Warning: exercise great caution at high altitudes when severe weather is in the area. After this pattern broke, we experienced four straight nights of excellent skies. A new pattern settled in that saw convection run amuck. Low level moisture was rising at night and cooling forming clouds throughout the majority of the night. Unfortunately, we lost the entire second week of imaging to clouds.